If the following occurs while driving, it could indicate a flat tire. • The vehicle begins to vibrate excessively. • The vehicle pulls in one direction. If you have a flat tire, drive slowly to a level spot that is well off the road and out of the way of traffic to change the tire. Stopping in traffic or on the shoulder of a busy road is dangerous. Changing a tire is dangerous if not done properly. The vehicle can slip off the jack and seriously injure someone. 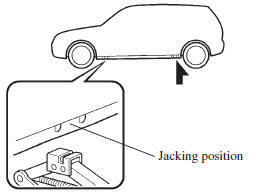 No person should place any portion of their body under a vehicle that is supported by a jack. Allowing someone to remain in a vehicle supported by a jack is dangerous. The occupant could cause the vehicle to fall resulting in serious injury. 1. Park on a level surface off the right-ofway and firmly set the parking brake. 2. Put a vehicle with an automatic transaxle in Park (P), a manual transaxle in Reverse (R) or 1, and turn off the engine. 3. Turn on the hazard warning flasher. 4. Have everyone get out of the vehicle and away from the vehicle and traffic. 5. Remove the jack, tool, and spare tire . 6. Block the wheel diagonally opposite the flat tire. When blocking a wheel, place a tire block both in front and behind the tire. When blocking a tire, use rocks or wood blocks of sufficient size if possible to hold the tire in place. 1. If your vehicle is equipped with steel wheels, pry off the center cap with the beveled end of the jack lever. Use the jack lever when removing the center cap. Using your hands to remove it may cause an injury. In addition, using a tool other than the jack lever may cause damage to the wheel or the center cap. 2. Loosen the lug nuts by turning them counterclockwise one turn each, but do not remove any lug nuts until the tire has been raised off the ground. 3. Place the jack on the ground. 4. Turn the jack screw in the direction shown in the figure and adjust the jack head so that it is close to the jack-up position. 5. 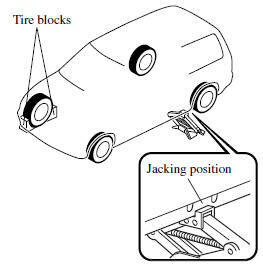 Place the jack under the jack-up position closest to the tire being changed with the jack head squarely under the jack-up point. 6. 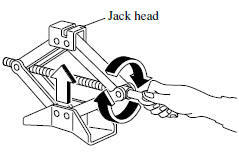 Continue raising the jack head gradually by rotating the screw with your hand until the jack head is inserted into the jack-up position. Attempting to jack the vehicle in positions other than those recommended in this manual is dangerous. The vehicle could slip off the jack and seriously injure or even kill someone. Use only the front and rear jacking positions recommended in this manual. Jacking up the vehicle in a position other than the designated jack-up position or placing objects on or under the jack is dangerous as it could deform the vehicle body or the vehicle could fall off the jack resulting in an accident. Using a jack that is not designed for your Mazda is dangerous. The vehicle could slip off the jack and seriously injure someone. Jacking the vehicle with an object under the jack is dangerous. The jack could slip and someone could be seriously injured by the jack or the falling vehicle. 7. Insert the jack lever and attach the lug wrench to tire jack. 8. Turn the jack handle clockwise and raise the vehicle high enough so that the spare tire can be installed. Before removing the lug nuts, make sure your Mazda is firmly in position and that it cannot slip or move. Jacking up the vehicle higher than is necessary is dangerous as it could destabilize the vehicle resulting in an accident. Starting the engine or shaking the vehicle while it is jacked up is dangerous as it could cause the vehicle to fall off the jack resulting in an accident. Going under the vehicle while it is jacked up is dangerous as it could result in death or serious injury if the vehicle were to fall off the jack. 9. Remove the lug nuts by turning them counterclockwise; then remove the wheel and center cap. If your vehicle has optional antitheft wheel lug nuts, one on each wheel will lock the tires and you must use a special key to unlock them. This key is attached to the lug wrench and is stored with the spare tire. Register them with the lock manufacturer by filling out the card provided in the glove compartment and mailing it in the accompanying envelope. If you lose this key, consult an Authorized Mazda Dealer or use the lock manufacturer's order form, which is with the registration card. 1. Obtain the key for the antitheft lug nut. 2. Place the key on top of the nut, and be sure to hold the key square to it. If you hold the key at an angle, you may damage both key and nut. Do not use a power impact wrench. 3. Place the lug wrench on top of the key and apply pressure. Turn the wrench counterclockwise. 1. Place the key on top of the nut, and be sure to hold the key square to it. If you hold the key at an angle, you may damage both key and nut. Do not use a power impact wrench. 2. Place the lug wrench on top of the key, apply pressure, and turn it clockwise. 1. Remove dirt and grime from the mounting surfaces of the wheel and hub, including the hub bolts, with a cloth. When changing or replacing a tire, not removing dirt and grime from the mounting surfaces of the wheel, hub and hub bolts is dangerous. The lug nuts could loosen while driving and cause the tire to come off, resulting in an accident. 2. Mount the spare tire. 3. Install the lug nuts with the beveled edge inward; tighten them by hand. Applying oil or grease to lug nuts and bolts is dangerous. The lug nuts could loosen while driving and cause the tire to come off, resulting in an accident. In addition, lug nuts and bolts could be damaged if tightened more than necessary. 4. Turn the lug wrench counterclockwise and lower the vehicle. 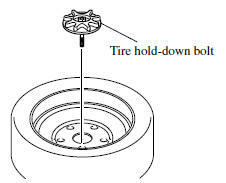 Use the lug wrench to tighten the nuts in the order shown. If you are unsure of how tight the nuts should be, have them inspected at an Authorized Mazda Dealer. Improperly or loosely tightened lug nuts are dangerous. The wheel could wobble or come off. This could result in loss of vehicle control and cause a serious accident. Because the wheel studs and lug nuts on your Mazda have metric threads, using a non-metric nut is dangerous. On a metric stud, it would not secure the wheel and would damage the stud, which could cause the wheel to slip off and cause an accident. Remove the center cap by tapping it with the lug wrench. 6. Store the damaged tire, using the tire hold-down bolt to hold it in place. 7. Remove the tire blocks and store the tools and jack. 8. Check the inflation pressure. Refer to Tires . 9. Have the flat tire repaired or replaced as soon as possible. Driving on tires with incorrect air pressure is dangerous. Tires with incorrect pressure could affect handling and result in an accident. When you check the regular tires' air pressure, check the spare tire, too.